Metropolitan Lawrence (Huculak) and Metropolitan Yurij (Kalistchuk) led an ecumenical prayer service of a Panakhyda for the millions of victims of the Moscow-organized genocide of the Ukrainian nation. One participant, perhaps prophetically, referred to the liturgy not as an ecumenical, but “united” prayer. 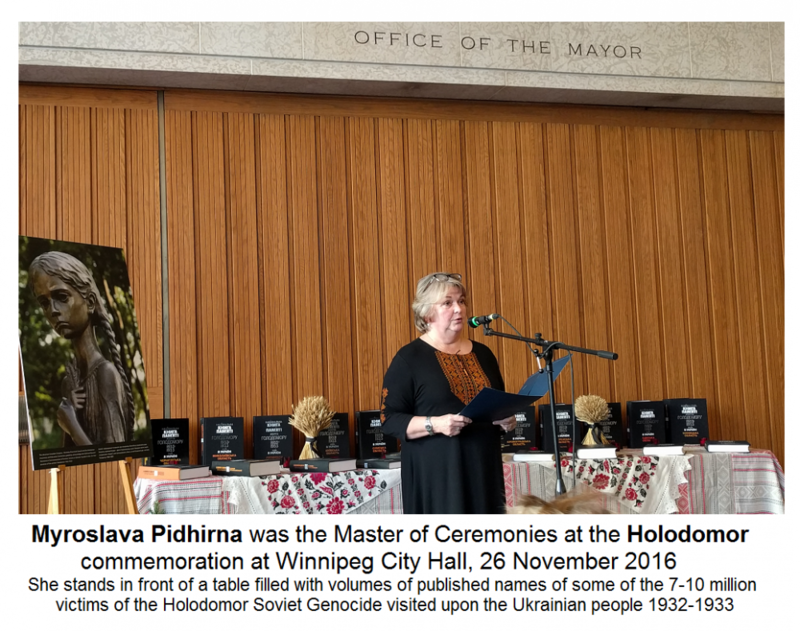 Every year, the Ukrainian community of Winnipeg and friends gather on November 26th for a “panakhyda” requiem service for the estimated 7 to 10 million children, men and women that were purposely starved to death to quell any patriotic sentiments of pride in their Ukrainian identity. So that the industrious and life-loving Ukrainian people would not prove to be even as much as an ideological challenge to the Bolshevik plan for a new ‘Soviet people’, they were mercilessly forced to starve and hopelessly watch their elderly and children die a horrific death by starvation. Some 20 members of the clergy were present, from both the Ukrainian Orthodox Church of Canada and Ukrainian Catholic Church. Most clergy joined in the concelebration, while some chose to participate with the singers. There was an extraordinarily large group of people gathered, perhaps due to the sunny warm weather [Those who regularly attend the event know that it is usually freezing cold! Not this day]. Among those gathered were many youth and children as well as a group of elderly - some were the children of survivors and others, amazingly, now nonagenarians who are actually survivors that have lived to this day to witness to the horrors that they lived through as children. Following the prayer service, all were invited inside for refreshments and to peruse fascinating exhibits associated with the Holodomor. There were pictures and displays. One table was filled with some 20 volumes of an average of a 1000 pages each filled with names of victims of the Holodomor genocide. A commission in Ukraine is trying to document as many victims as possible. It is an impossible goal as the million or so names already collected barely scratches the surface of the total number that can be documented from such a record-deficient time and place in history. But even if the number of documented murders is merely doubled, that will contribute toward the overall verification of the unspeakable inhumanity between two peoples of the human race. Myroslava Pidhirna served as master of ceremonies for the program within the city hall. She thanked all the dignitaries that made the time to be present and thanked the many people that also decided to come out in numbers that haven’t been seen in some time. Myroslav also remided everyone to keep the tradition of lighting a candle in a street-front window at 7:32 pm (i.e. 19:32) to remind the world the the two-year tragedy that began in 1932... 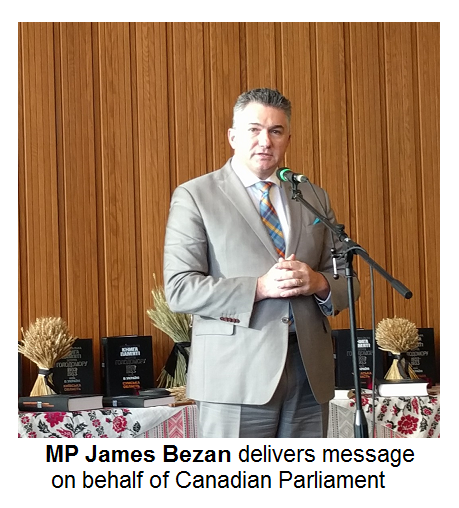 Among those that spoke were Conservative Member of Parliament James Bezan who brought greetings on behalf of all his fellow parliamentarians. Then the Conservative Member of the Manitoba Legislature and Minister for Crown Services, the Honourable Ron Schuler spoke very boldly about how the occasion moved him body and soul. As the event was sponsored by the Manitoba provincial Council of the Ukrainian Canadian Congress, it was appropriate that the council’s President Oksana Bondarchuk brought greetings to the event. The keynote speaker was Dr. John Young, President and CEO of the Canadian Museum for Human Rights. Everyone was impressed moved by his presentation during which he himself became emotional at times. Children from Winnipeg’s “Ridna Shkola” offered marvellous performances of theme-appropriate songs and verses. The Plast Ukrainian scout organization joined in for beautiful renditions of the closing songs. Winnipeg’s CTV covered the story in its news service.